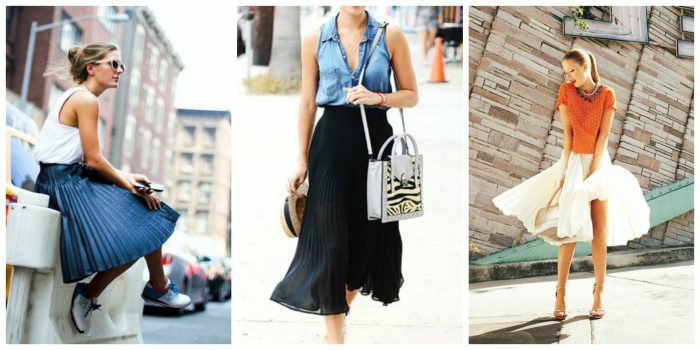 I want to show you my favorite pleated skirts outfit ideas for Summer months. In this collection are gathered simple and easy to wear looks featuring short, midi and maxi pleated skirts that are ideal for special events and everyday wear. Most of you wondering if pleated skirts are still in style 2018, the answer is BIG YES! That’s why I made this article to show you best tips and ideas how to wear it in real life. So, what are you waiting for, take a close-up look and get inspired by these stunning street style images. This might be one of the biggest fashion trends for the upcoming year and the reason is the feminine look that makes the pleated skirt so wanted. It’s not too preppy, or old-fashioned, it’s not too much glamour or overrated. Sure, they are difficult to take care of and maintain ideal pleats, but they can make every woman look dressy and classy. 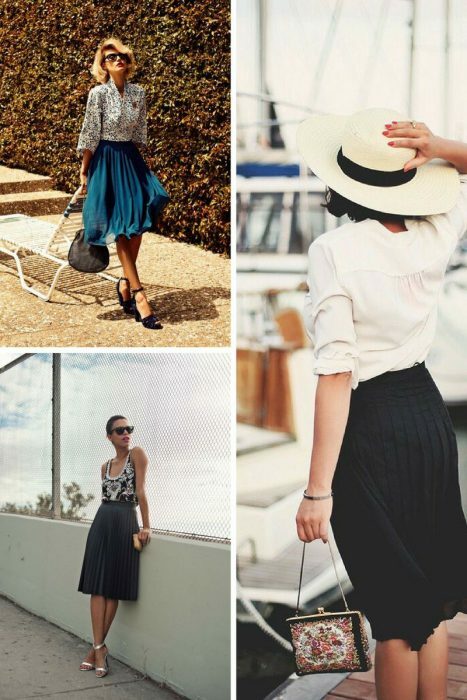 There are a million ways how to wear pleated skirts and I want to show you only the best looks you can easily copy. The first thing you should do is to find a pleated skirt that ideally suits you, it can be a midi or shorter length cut with tiny or large pleats in neutral classic or bright color. A knife pleated midi skirt can look dressy, just make sure to add a plain t-shirt and statement necklace with heels and fancy bag. If it’s too cold outside, then I recommend to try on pleated skirt with a lightweight sweater and skinny belt. If you still feel cold, then you definitely should add a fitted, cropped leather jacket and complete it with tough ankle boots. By the way, you can also add a pair of tights underneath a skirt. 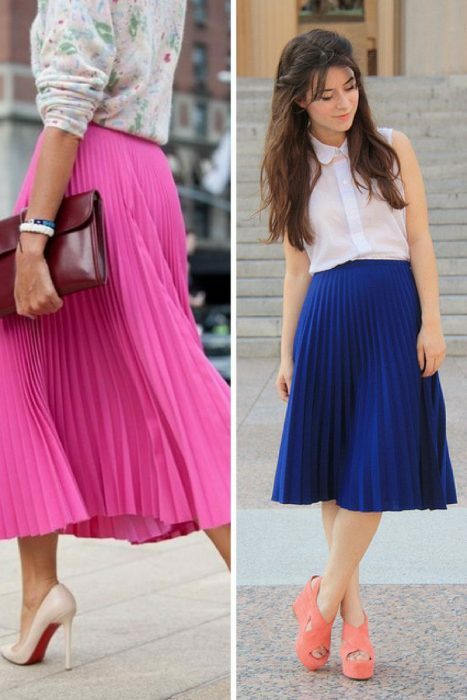 If you choose a bright pleated skirt, then make sure to pair it with a solid neutral color top. I know many ladies who wear such skirts to work, they pair them with a fitted blazer, classy heels, and neutral color shirt. 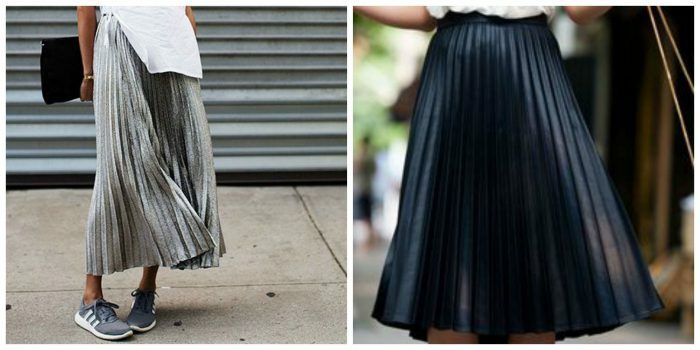 Pleated skirts look tremendously cool with layers. Try it on with a classic turtleneck and cardigan. Most of us think of this garment as something dressy that can be used for going outs, but you can try it on with casual pieces, creating a dressed down look for daytime walks. The versatility of this skirt drives me crazy! You can team it with ankle boots, gladiator sandals, heels, sneakers, etc. There are thousands and more possibilities. The possible combinations are fun, flirty and easy to mix.